The video is from Last Year, Oct 2018. 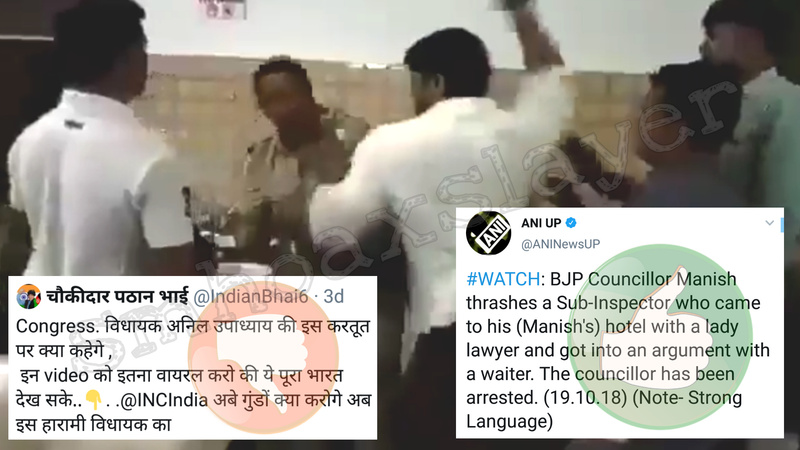 It wasn’t any Congress men but a BJP Corporator Manish Chaudhary in Meerut, who later was arrested for beating a Sub-Inspector. “Manish Chaudhary was arrested under non-bailable offences, will be produced before the court on Saturday. His supporters came to the police station to protest, we showed them evidence… The S-I is definitely at fault for he shouldn’t have been there in the 1st place. The probe is on,” said Superintendent of Police (City) Ravinder Singh.Meanwhile, Panwar was sent for a medical examination and was relieved of duty pending an investigation into the matter. ← No, Chaiiwala signboard does not have Abhinandan’s face painted on it. Is this video recent from Pakistan ? This Air-conditioned Bus Stop is an Daikin Initiative, not AAP government.